A small hill of El Toro in the Mexican state of Guan Huatlo. In the summer of 1944, a successful businessman from Denmark, Waldemar Julsrud, who had his own store in the small town of Akambaro, set off on a morning walk near El Toro. Here, clay figurines accidentally caught his eye. One of them resembled a mammoth. The businessman lived in Mexico from the end of the nineteenth century and was very interested in the ancient culture of this country. For example, in 1923 he took an active part in the excavations of the cultural monuments of Chupikauro, dating back to the fifth century BC - the fifth century of our era. During this time, the businessman has already learned to understand artifacts quite well and therefore realized that the figurines he found do not belong to the famous civilizations of pre-Columbian America. Julsrud begins excavations, hiring only one worker and promising to pay for each whole statuette one peso. For the peasant it was good money and therefore he worked very carefully. However if he found broken figures, he carefully glued them together. He did not want to lose the extra pesos. This was the beginning of a huge collection, the work was continued by his son Carlos, and then by his grandson. According to different sources, the collection consists from 33 to 37 thousand exhibits. Among them are many varieties of prehistoric pangolins that disappeared from the face of the Earth several million years ago. All pieces of animals are unique, as well as other objects. They are all made in a single copy. Among them, there are species of reptiles well known to science and also some quite "unknown animals." Numerous expert examinations were carried out on the latest word of modern science, which confirmed the age of the finds - the third millennium BC. In the collection there are statuettes of people, reminiscent of Japanese. The proportions of the body were somewhat disturbed, and their clothes aroused great astonishment. But even more surprising was the fact that the figures depicted absolutely all races and nationalities, including many Caucasian peoples. The sizes of figurines vary from 10 cm to 1.5 m.
It is striking that there are joint images of people and pangolins. This was the reason for discrediting the discovery of Julsrud, since they refute the long-established linear evolution and the Darwinian theory of the origin of species. In 1947, the businessman published a book about his collection, but the science world did not react. There were also other subjects, such as jade or obsidian musical instruments. Skulls of people, mammoths and ancient horses were also found. In 1950, the mysterious repository of figurines was visited by the famous journalist L. Harmer from the USA. He visited the hill, where archaeological excavations were conducted and took several photographs. Another American, U. Russell, published an article accompanied by photographs taken from the excavation site. The journalist emphasized that the figurines were extracted from a depth of at least 1.5 m and it was necessary to carefully cut the mighty roots of old trees that had them entangled. Only these materials made scientists pay attention to these amazing artifacts. In 1954, a delegation of quite venerable scientists was sent to Akambaro under the guidance of Professor Eduardo Norkvera. In the controlled excavations, three anthropologists and a historian also took part. In a few hours they dug up many similar figures and expressed a positive opinion about their age. Congratulating Julsrud, the delegation returned to Mexico City. 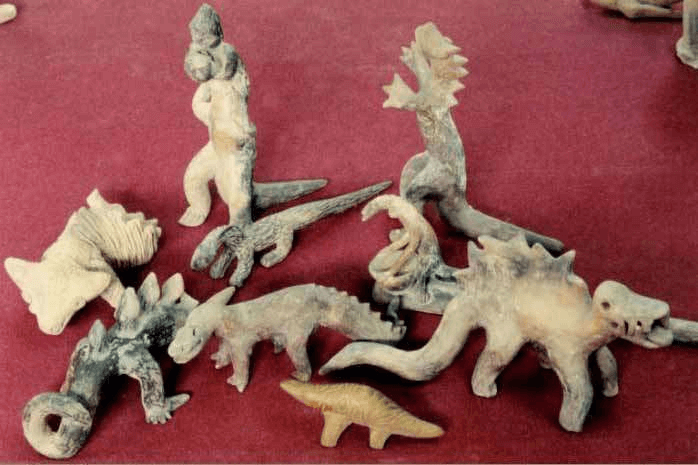 A month has not passed since the report on the results of the expedition said that the figures are falsification, since there are statuettes of dinosaurs. The following year Professor Charles Hapgood came to the place. He not only made excavations on the hill, but also opened the floor in one house nearby. At a depth of 2 meters he found shards of 43 of the same figures. In 1968, Hapgood again visited the town with his friend E. Gardner, and in 1972 sponsored the publication of the book "Secrets of Acambaro." There are reports that there is a whole cave in the slope filled with all sorts of mysterious objects. Perhaps there is a whole "underground city". In 1997, the NBC television channel broadcast a series of programs "Mysteries of Civilizations", which also talked about the figures of Julsrud. Authors within the framework of the program sent two samples for examination according to the latest C14 method. The human figure was dated to the 4th millennium BC, and the lizard - 1500 BC. But then it was announced that the date of crafting of the dragon - was not precise. Two Americans helped to popularize the finds: anthropologist Denis Swift and geologist Don Patton. For 1999, they repeatedly visited and jointly obtained permission from the administration for the opening of the museum. Professor John Thierry, who has studied the riddles of the hill for more than forty years, says that the figures found are only a small part of the giant "library" that accompanies the tomb, possibly some leader of an unknown ancient civilization. It is the tomb that should become the goal of studying for scientists of various fields of science. It is waiting for them. Mysterious, unexplored and yet inaccessible.